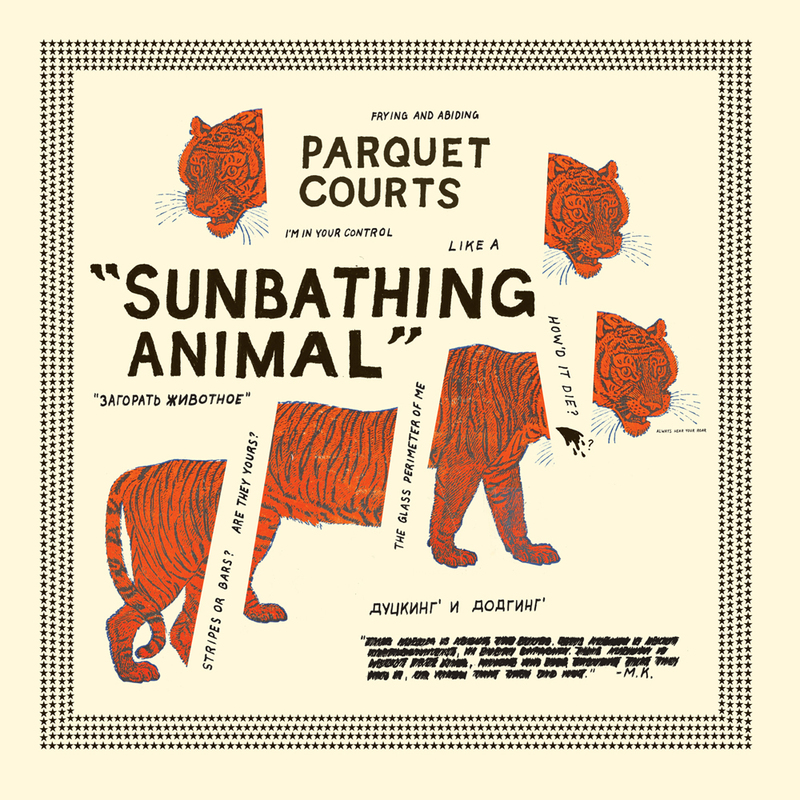 I’ve been slow to update recently, but in case you hadn’t noticed: Sunbathing Animal, the new full length by Parquet Courts, is out now! The New York Times wrote a large feature about the group leading up to the release (in which I am briefly quoted! ), as did the Washington Post, Pitchfork, Grantland, and Stereogum. Reviews have been across-the-board positive, from Pitchfork’s ‘Best New Music’ nod, to Spin deeming it ‘Essential’, to Stereogum naming it Album of the Week. I got a copy of the LP a couple weeks ago and listened through it again for the first time in a while. I don’t know how to write about it without sounding like a proud papa, but maybe that’s just what I am. The artwork is stunning (Andrew kinda blew me away this time), and sitting there poring over the packaging while the music played from my stereo, I was able to forget that I had anything to do with making it and just enjoy it. It’s a cool record – catchy and gnarly and tough and fun – the kind of record that made me want to make records in the first place. We worked really hard to see this vision through, and I couldn’t be happier with the results or the reception it has had. Their homecoming show last week at Sugar Hill Supper Club (with our pals Protomartyr and Future Punx) was icing on the cake… just that much sweeter. My copy of the LP also came with a 7″, featuring an alternate version of ‘Black and White’ and another Sean song “Tic in My Brain’. We couldn’t figure out which version of ‘Black and White’ we liked better, so they just put them both out. Austin and Johann Rashid made a pretty stellar video for this second version of ‘Black and White’. Impose Magazine recently posted a mix Bob and I made as Eaters. We worked out the song selection together, with “each artist embodies a spirit of exploration in their work and blurs the line between outlier and trailblazer.” But Bob’s the real brain behind this mix, and it sounds fantastic… a proper journey. We’ve been working on some new material, and have some shows coming up this summer, including this one at Glasslands on July 11th. I’ve been busy with a lot of other great projects (including a new Future Punx EP), but wanted to get this out there before too long…. talk at ya again soon.